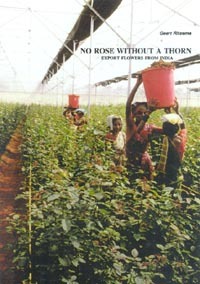 The report "No rose without a thorn: export flowers from India" is a publication by the India Committee of the Netherlands (ICN). It was first published in the Netherlands under the title "Geen roos zonder doornen: exportbloemen uit India" (November 1997). The opinions expressed in this report are only those of the author, and not necessarily of the ICN. 'Blooming business' and 'rosy future'. These are the words the Indian authorities use to sing the praises of the flower industry. The central government and the state governments grant subsidies and give information to stimulate the building of greenhouses for the cultivation of roses, carnations, chrysanthemums and other cut flowers. This development takes place mainly in the countryside surrounding the metropolises Bangalore, Mumbai (Bombay) and Delhi. During the last years the acreage of flower greenhouses has tripled or even quadrupled near these cities. Hopes are running high. A growth percentage of 30% is being mentioned. India hopes to get its share of the growing demand for cut flowers in the world. This trade is considered a goldmine and a panacea for India's economic and social problems. The flower trade is said to create plenty of employment opportunity. Moreover, the export of cut flowers would earn a great deal of foreign currency. This is very important to India. It has a debt of fifty thousand million US dollars and is listed third on the world rankings of debt countries - after Mexico and Brazil. But there is quite a different story to tell about flowers. And this is the story about pesticides, pollution of water and soil, about bad labour conditions and sick labourers. The artificial cultivation of flowers in greenhouses is said to be the most polluting agricultural activity humanity ever created. The industry originates from Western Europe. Holding 60% of the world trade of cut flowers, the Netherlands is by far the most important producing country. During the past two decades, however, the flower industry has gained a foothold in the Third World, the Western Europeans often holding a big finger in the pie. For instance, the floriculture in Kenya is largely in the hands of foreign investors, including the British-Dutch multinational Unilever. This means that a large part of the profits is pumped back into the Netherlands and Great Britain, leaving the Kenyans with the ecological problems. An example: the water level in the Naivasha lake falls every year by 15 cm because of the enormous water consumption by the surrounding flower industries. Conclusion: there are plenty of reasons to take a critical look at the growth of the flower industry in India. Who are the investors in this sector, where do the profits go and who benefit by the substantial government subsidies? Does the international flower trade have as many opportunities as is often suggested? Is the demand for cut flowers growing at the same high pace as the supply? Will the market not become oversupplied and is collapse not imminent? What are the consequences of floriculture for the environment and what measures are taken to prevent environmental damage? How are labour conditions in the floral industry? How are health hazards of pesticides dealt with? This report deals with those questions. This text is based on interviews and documents we collected in India during the first six months of 1997. We focus on the district of Bangalore, the main district for the production of flowers in India. We pay full attention to the activities of the Dutch. They play a major role in the growth of the floral industry of India. Anyone who has observed what is happening in the Indian flower industry can draw only one conclusion: the scent of the Indian export rose is not sweet, but bitter. Just like everywhere else in the world, the Indian flower industry pollutes the environment. This form of agriculture (or is it industry?) does not fit in with the idea of a sustainable society. It is a poignant fact that the Indian flower sector is co-financed by Dutch development aid. One should wish India a more human and environmentally friendly development! The Indian government spends many subsidies on the export flowers. But the profit from this investment is dubious. It is the Dutch entrepreneurs who profit from the Indian flower industry. The Indian workers on the other hand are the victims: they have to do hazardous work in greenhouses for moderate wages and without any social security. Of course this means more employment, but is this the kind of work the Indians really want? And in numbers this employment does not amount to much. The sector is very capital intensive. One acre needs an investment of 200 to 300 thousand US dollars. An average of 20 labourers works in one acre. This means that it costs 10,000 to 15,000 dollars to employ one labourer. This is an extremely expensive job by Indian standards. The same amount of money would provide jobs for more people in other sectors. The most important recommendation is to stop the flower industry in India, or at least check its growth. This is certainly possible. The rise of the flower industry is not a natural process and it has little to do with a development of the market economy. The Indian and - to a lesser degree - the Dutch government play an important part in promoting and financing. This means that subsidies may be used in other ways and development may be guided into another direction. India is at an advantage as compared to other flower producers like Kenya and Colombia. Since the Indian flower sector is still small, the cut in subsidies will be less painful. Another course is still possible without too drastic consequences. While the flower industry is still there, rules must be tightened. A good and clear registration of pesticides is needed. 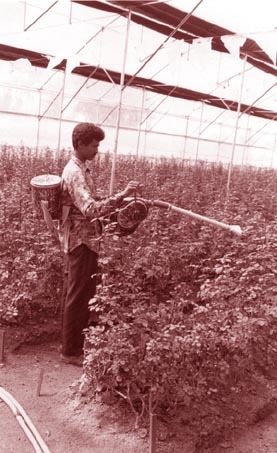 Moreover workers have to be trained in the use of pesticides. Protective clothing must be of the same standard as the clothing used in Dutch greenhouses. Pesticides (like DDT and captan) banned in the Netherlands and Europe must not be used. Double standards cannot be justified, particularly not in companies co-managed by Dutch people. The waiting times after spraying in greenhouses prescribed by the WHO should be observed. Growing flowers in greenhouses appears to be very profitable in India. That is to say: it is profitable for foreign, mainly Dutch companies who sell planting materials, technical knowledge and cooling units. Their Indian buyers and joint venture partners still have to wait and see how profitable the sector will be for them. Many chemical pesticides are being used in the flower industry. is characteristic of this setup that the major share (90%) of the investments is at the expense of the Indians while it is exactly the opposite where the profit is concerned: approximately 90% is for the foreign partners. Moreover, the risks involved in an unpredictable international flower trade are exclusively at the expense of the Indians. A surplus is imminent on the international market for roses - India's chief product. Even now a fall in price is becoming visible. If this crisis continues, the profit of the Indians will disappear like snow in summer. But the foreigners have secured their profits through the sale of raw materials and equipment. In short: the flower industry is much more profitable for foreign companies than for their Indian partners. It is characteristic that the flower industry in India began to grow after new loans by the IMF and that the sector has been stimulated by the FMO, a development bank, which represents the Dutch state and Dutch banking. But even if the Indian flower industry becomes successful, the economic profit for the population will be minimal. The investors in the flower industry are big agricultural and industrial companies. For others investing is hardly possible: the outlay on greenhouses is between 200 and 300 thousand dollars per acre. The foreign exchange earned in the flower industry and the generous Indian state subsidies fall to the elite only. The employment results in the Indian flower industry are far from impressive. In the greenhouses there is an average of 20 workers per acre. This means that one job costs 15,000 dollars. This money can give jobs to many more people in India. It also became clear that the flower industry not only creates jobs but also costs jobs, for the land to build the greenhouses on is often purchased from (small) farmers. Particularly in the Third World, the flower industry is a sector with a high 'casino percentage'. The risks are high, quick profits are aimed at, and there is hardly any concern about long term effects. The same goes for environmental pollution. By sketching a picture of a beautiful natural product, the government and business disguise the environmental hazards. But in reality, huge risks threaten the environment: floriculture inherently needs a high dosage of artificial fertilizer and pesticides. These developments are not only ecological hazards, but also endanger food supplies. Continuous and intensive cultivation of flowers will eventually lead to sterile soil and no cultivation of any crop will be possible at all. Another thing is that an extremely high amount of groundwater is pumped up, in areas too, where the groundwater level is critical, like in the Bangalore district. The land used for the greenhouses for roses appears to be bought from small farmers. Since the farmers usually produce cheap food, these sales greatly affect the food supplies of the poor population. The wages in the greenhouses are poor even by Indian standards: between 0.75 to 1 dollar per day. Moreover the fringe benefits are very bad: the workers do not get the holidays and bonuses that are provided for in other sectors of industry. Added to this they run big health risks. Protective clothing is lacking or is insufficient. The workers get hardly any or no information about or training in how to handle hazardous pesticides. Pesticides are used which the WHO classifies as 'extremely dangerous' or 'highly dangerous'. The waiting times after spraying prescribed by the WHO are not observed.